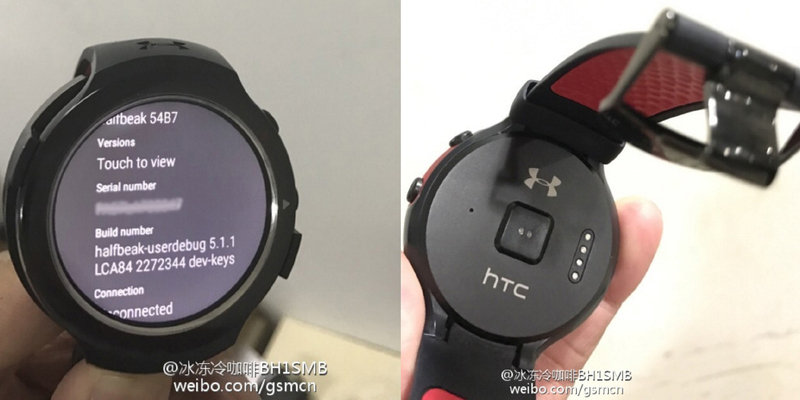 The HTC smartwatch based on Android Wear and so far known by the code name Halfbeak, has become the star of the day after a new set of leaked photos on the network. In the images in question, you may see, beside the HTC logo, the Under Armour logo (it has already been an official partner of HTC for the production of the product line devoted to wearables). The photos confirm the presence of a sensor to monitor heart rate, a strap with rather sporty look and a circular screen with a resolution of 360 x 360 pixels. In another image also it confirms the presence of Android Wear operating system combined with the name in code of the smartwatch. This in regard to the software, which seems a substantial improvement in terms of time for its official launch. Speaking of that, we still talk of a device supported by rumors rather than some news, and it seems that the device will be ready before the end of this fall. Needless to say that the Taiwanese giant has not provided any details on this and has not confirmed a release date for its device, much less on what terms is being developed right now. Regardless of how things evolve, the hope is that the company decides to show its new wearable in a month or two. In another vein, but related to the world of smartwatches, a recent news says that several smartwatches based on Android Wear platform have proven to be incompatible with the new iPhone 7 and iPhone 7 Plus. For those who do not know, compatibility with iOS to Android smartwatches came in August 2015, to all owners of iPhone 5 or higher models. However, a number of testimonies collected within discussion forums of Android Wear, emphasize that the iPhone 7 shows incompatibilities with some of the most sought after models on the market, like the Moto 360 (2015), Moto 360 Sport, Tag Heuer Connected, Asus ZenWatch 2 and Fossil Q Founder.